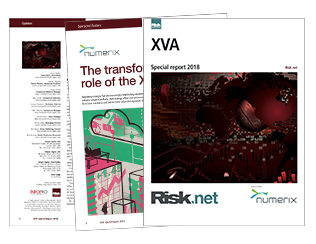 This Risk.net 2018 XVA Special Report addresses a number of the hot button issues that continue to challenge the OTC derivatives marketplace today, such as the complications of XVA adoption, the impact of regulatory drivers, the complexity of pricing and risk calculations, the radical changes presented by new technologies, and the elusive capturing of profitability. Among the report’s key highlights is a feature article contributed by Numerix expert Satyam Kancharla, in which he weighs in on the transformational effect valuation methodologies are having on the derivatives industry, how firms have reacted to and tackled regulatory forces to meet new market requirements, and the role of the XVA desk. Mr. Kancharla also participates in an XVA forum, where he joins a panel of other industry thought leaders to discuss XVA best practices and other top-of-mind issues. Complete the form below to download this complimentary Report.